I ordered a couple of books while looking for that bunny, on the online www.fabshophop.com . I ran across a BOGO sale at www.quiltersobsession.com . 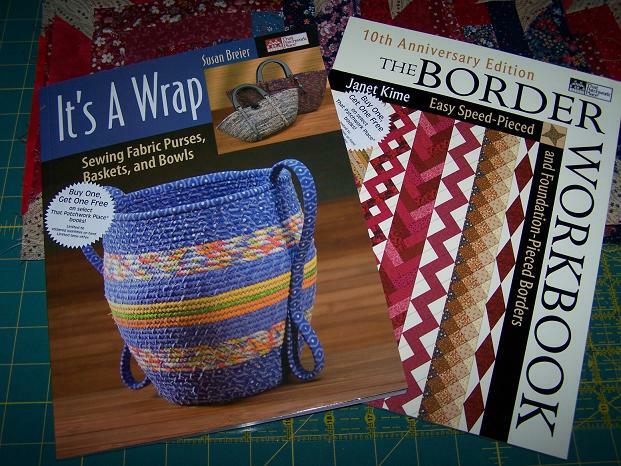 I’ve thought before that I would like to know how to make these fabric bowls & baskets, and I liked the look of this border book, and what could be better than getting one free!? Yummy, something fun to look at while I’m watching TV in bed tonight. My Teeter Hang Ups inversion table came today, too! DH is reading that instruction book 🙂 That’s really all I have to report today! It was my all day Friday at work today, so I’ve only been home a couple of hours. I need to clean/oil my machine and table, and staighten my work area to get ready for the next project. TGIF!! Sounds like a good weekend in the making to me! Can’t wait for a table report 🙂 I promise to not beg for pictures of you trying it out 😉 I think that in a wrap book looks interesting too. I just got through trying out the table, Jan! It was a little scary at first, but I think I’m gonna like it. My Mom is wanting to give it a try, too…she said she’s been wanting one for awhile. Yippeee!! I got stuck upside down one day ROTFL took me a couple of seconds to get it to swing because I didn’t realize DH had changed the height. DH now asks that I do it only when he is home 🙂 The dogs find it very entertaining LOL I hope it helps!!! Let me know what you think of the borders book – I’ve been pindering getting that one. The book on fabric baskets is great. I checked it out at my local library and made these baskets: http://enchantingquilts.blogspot.com/2007_03_01_archive.html they are addicting and you can use junk fabric which I have a box of (they were given to me). « A cute quilt and a great panto!